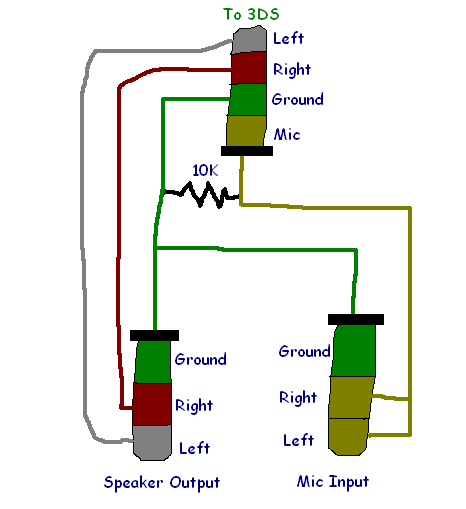 Is the Nintendo 3DS audio jack OMTP (LRMG) or CTIA (LRGM)? I'm gonna have my dad solder a custom cable which connects the left audio tip of one TRS plug to the mic ring of another TRRS plug. #9 ✎ 1733 12Me21 Syntax Highlighter Received for creating the code syntax highlighter on SBS Night Person I like the quiet night and sleep late. Express Yourself Update: I've made my own adapter. Make sure there's nothing plugged in to the microphone jack when you plug the adapter in to the 3DS, otherwise it might not detect the microphone.